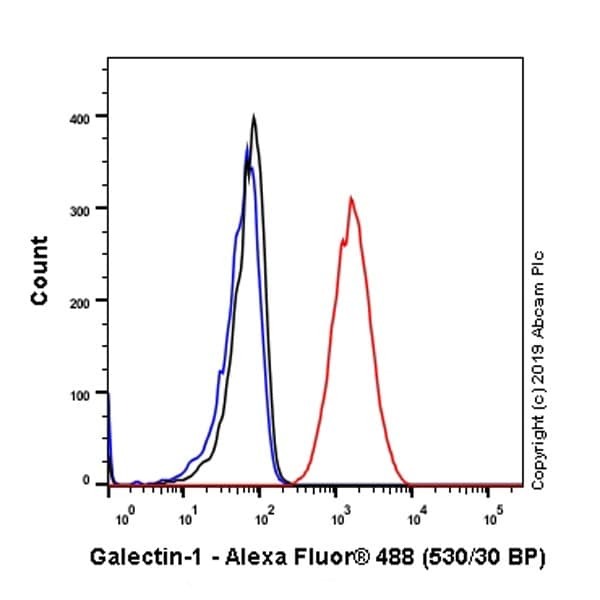 Synthetic peptide within Human Galectin 1 aa 50-150. The exact sequence is proprietary. Our Abpromise guarantee covers the use of ab138513 in the following tested applications. WB 1/1000 - 1/10000. Detects a band of approximately 14 kDa (predicted molecular weight: 15 kDa). Lanes 1 - 2: Merged signal (red and green). Green - ab138513 observed at 15 kDa. Red - loading control, ab9484, observed at 37 kDa. ab138513 was shown to specifically react with Galectin 1 in wild-type HAP1 cells as signal was lost in LGALS1 (Galectin 1) knockout cells. Wild-type and LGALS1 (Galectin 1) knockout samples were subjected to SDS-PAGE. ab138513 and ab9484 (Mouse anti-GAPDH loading control) were incubated overnight at 4°C at 1/1000 dilution and 1/20000 dilution respectively. Blots were developed with Goat anti-Rabbit IgG H&L (IRDye® 800CW) preabsorbed ab216773 and Goat anti-Mouse IgG H&L (IRDye® 680RD) preabsorbed ab216776 secondary antibodies at 1/20000 dilution for 1 hour at room temperature before imaging. Immunohistochemical analysis of paraffin embedded Human kidney tissue labelling Galectin 1 with ab138513 antibody at a dilution of 1/250. and permeabilised with 90% methanol. Immunohistochemical analysis of paraffin embedded Human skin tissue labelling Galectin 1 with ab138513 antibody at a dilution of 1/250. Immunohistochemical analysis of paraffin embedded Normal Human Stomach tissue using ab138513 showing +ve staining. Immunohistochemical analysis of paraffin embedded Normal Human Spleen tissue using ab138513 showing +ve staining. Immunohistochemical analysis of paraffin embedded Normal Human Placenta tissue using ab138513 showing +ve staining. Immunohistochemical analysis of paraffin embedded Normal Human Heart tissue using ab138513 showing +ve staining. Immunohistochemical analysis of paraffin embedded Normal Human Brain tissue using ab138513 showing +ve staining. Please tell me what is the best diluent used for the western blotting ? I should prepare the antibody in milk or BSA, to maintain it stability. We suggest diluting ab138513 1/1000 in 5% BSA/TBST immediately prior to use in western blot.